Yesterday, we published a piece that was sent in by a travelling Watford fan (Alex Keating) following our 2-1 loss at the weekend. Strongly-worded, and full of some bitter truths, he accused Newcastle fans of an unwarranted “cultural arrogance”. You can read the piece HERE. Today, we have a riposte from the MailOnline’s Rohan Banerjee. Alex Keating’s Away Fans’ Perspective piece on The Spectator’s View made for interesting, if irritating reading. While he is undoubtedly spot on about a number of the problems at Newcastle, namely the sub-par squad, misguided transfer policy and seeming sense of detachment from several key figures in the dressing room; the primary source of my ire comes from his choice of terminology. In his overarching charge of “arrogance” throughout the article, the Durham University-educated southerner Keating, I feel is guilty of the same sin himself. That Keating believes Newcastle fans to be arrogant and drunk on a sense of entitlement is a line regularly peddled by the mainstream press. It’s a patronizing narrative – silly Geordies, not much oxygen up there, too much time on their hands, haven’t won anything for yonks, who do they think they are? Yet, the fact that Fleet Street continually sounds out this account doesn’t make it any more correct. What Keating calls arrogance, I view as understandable frustration. Newcastle fans are not moaning because their team isn’t doing what they should be doing; they’re upset because they’re not doing what they could be doing. Indeed, much of the Mike Ashley ownership has been themed by cutting corners. Even the long-awaited investment in the last transfer window saw the unproven Aleksandr Mitrovic preferred to the proven Charlie Austin for the sake of a couple of million quid. The sense of injustice at Newcastle is that the club has the resources to do much better, but since 2007 has consistently demonstrated a reluctance to try. With weekly ticket gates exceeding the likes of Liverpool, Chelsea and Manchester City, it does not seem unreasonable to ask for more than the perennial brushes with relegation. Ashley is a multi-billionaire, somewhere in the top 20 richest men in Britain, but from a cursory glance at Newcastle, you would never guess. It’s round about this time that southerners will ask why should he spend his money on the club? I counter-pose, well why own it if not? The Toon is, as even Keating concedes, a goldmine waiting to happen. With a tribally loyal fan-base, huge stadium, storied history and if they lived up to their reputations, a core of European players with which to push on. Thus, I remain bewildered as to why Ashley has never really made the most of the club. Sports Direct signs would benefit more if they got shown in the Europa League than last on Match of the Day. While all that is true, contrary to what Keating purports, I think most Newcastle fans are realistic. We are very self-aware of the limitations of our squad and know that breaking into the top seven or eight again will take a while. What we’d really like to see is some pride restored – a solid finish in the league, without too many hammerings and free of any dalliance with the drop. It would also be nice if the board did not provide journalists with so much ready-made mud to sling. Why did the opening statement on manager Steve McClaren’s appointment include details of a potential five-year extension before a ball was kicked? We really are the joke club that keeps on giving. Moving on, my second issue with Keating’s piece is in his criticism of Newcastle fans harking on about bygone eras. It’s all about the now, he insists, but what if the now is really bloody awful? Is it a crime to yearn for a return to happier times? The American poet Walt Whitman famously wrote, “Happiness is not in another place, but this place, not another hour, but this hour.” I wonder if he would have said the same if he could have compared Gary Speed to Vurnon Anita. It is that nuisance of comparison that torments most Mags. We’ve seen our team in the Champions League and the Championship in the same decade; forgive us for feeling a tad hard done by. Fans of all clubs resort to nostalgia when times are tough, so why should we be any different? Why is it ok for Manchester United fans to long for the return of Cristiano Ronaldo, when the worst they’ve finished since he left is seventh, but it’s not alright for us to wish for Alan Shearer back when we’ve only scored three goals in the league this season? Yes, the halcyon days of Sir Bobby Robson and Kevin Keegan’s ‘Entertainers’ might be in the past, but we shouldn’t be told to forget them. I think what pains me most about following Newcastle these days is the lack of respect we get from other clubs’ supporters. I hasten to add I don’t think that the Ashley era has done much particularly worthy of respect – ipso facto the serial PR gaffes, open condemnation of cups, throwing Robson’s memorabilia into a skip and so on – what I mean, is I hate how we’ve gone from being the club everyone used to have a soft spot for, to being the one that everyone likes to see fail. That Keating, the fan of a newly-promoted side, felt the need to blog about how good it was to teach us a lesson at St James’ Park, is indicative of the wider public’s mood towards us. Keating’s piece is not bad and as I admitted before, raises several salient points about Newcastle the team, but it is tellingly written by an outsider and therefore light of insight on Newcastle the club. The Away Fans’ Perspective is exactly that – I speculate that his visit to Tyneside involved little to no interaction with supporters from the city. Nowhere else in English football, do the fortunes of a football team matter more than in Newcastle. After having every other industry crippled by the government, the Cathedral on the Hill stands alone as the last great beacon of hope. That the current state of affairs under Ashley and McClaren does not reflect this is quite frankly heartbreaking, and I won’t be told differently. The Spectator’s View has been nominated for the Young Blogger of the Year at the FBAs. Vote for us here! 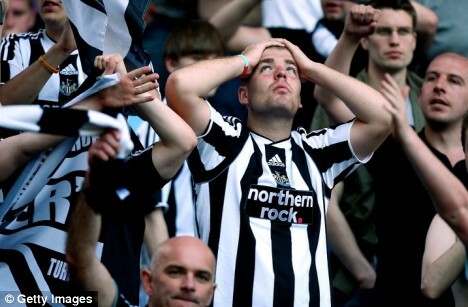 9 Comments on Why do Newcastle Fans Moan all the Time? What is it exactly that Newcastle fans want from their club? This is what football fans just do not understand about Newcastle United, and it really isn’t very clear as to what the fans want to support. Do Newcastle fans want to finish 5th in the league, or a similarly competitive position? Because you might remember Alan Pardew took the club there, yet he was kicked out the club because the fans “didn’t like the way they were treated”. 5th!!! 5th!!! Is that not what the club yearns for? A high finish, where they are a threat and difficult to play every week? Pardew could easily have taken Newcastle on to bigger and better things, and perhaps this week after Sir Alex Ferguson in his exclusive Sky interview admitted Pardew is a good manager, Newcastle fans might wonder why they didn’t treat him more kindly. But he wasn’t very kind to the fans, so they don’t want to finish 5th. Do Newcastle fans want to win trophies? Because if they do, then they should realise how detached they are from the club’s history – Newcastle has never been a decorated club, unlike Liverpool and Man United (that’s why it is acceptable for Man United “to long for the return of Ronaldo”), and therefore have no right to demand the winning of trophies, or frustration at not doing so, as I’m afraid it is not in the club’s make-up. The last trophy they won was the Inter-Cities Fairs Cup in 1969, the last time they won the league was in 1927. You might not like to hear this, but Sunderland have won the top flight 6 times, and Newcastle have won it 4 times, yet I have never heard a Sunderland fan wine and whinge that the club is not competing for trophies. How about Pardew being a good ‘Manager”? Well at NUFC he wasn’t allowed to be a Manager, just like McClaren now. Mike Ashley and the club ‘model’ categorically states they DO NOT want a Manager! The heady season of 5th was thanks to players he didn’t sign but unfortunately for us, Carr who did, has fed off that since. Mr. Carr’s mission seems far more focused on ensuring his employer turns a profit on a player, than he does in ensuring the Club have players who are PL ready and capable. His track record since has proven that, as has our PL positions and continual relegation fights. Pardew was given a hard time mostly because of his almost religious defence of that regime, until he himself was given an exit route and boy did he take it. And yes – we certainly do yearn for a Manager. A capable one allowed to get on with building a team of his own, that plays in a way he wants and in a way that at least proves they want to achieve more than a quick move to another Club. MJW Ashley won’t allow that though. So stop attacking the supporters and look to where the real blame lies for our discontent, and the man who is doing a huge dis-service to football itself. I hate to tell you, mate. But we perfectly are aware of the low probability of winning anything. We simply want a team that tries, that competes, that excites and – is worth paying the entrance fee to watch. When is the last time we had that? Yes, one season out of Ashley’s ownership when the stars aligned to give us good players – who where then immediately sold on. Sure, so I think you’d agree with my last paragraph then on my comment at the top…? Well, the other thing we are sick of is people telling us what we should want, expect, or not. Like you. The fact that you understand nothing of the Pardew situation up here (like the pundits etc) is what gets at our throats. Pardew’s current success is the absolute highlighter of what is wrong up here under Ashley, not what is wrong with the supporters. Newcastle fans simply want a team that tries and an owner that has the best interests of the club at heart, not (as is the current situation) the best interests of his Sports Direct company at heart by giving them free advertising and simply providing sub standard players who simply struggle to exist in the Premiership. Every pundit and fan from other teams simply dont get that and jump on the mis informed bandwaggon that we have high expectations of getting anywhere near the top 4 under this mans ownership. Pardew got the trouble he did because he meekly stood in front of the cameras and defended Ashley even though he wasn’t getting the backing he wanted in terms of bringing in the players he wanted while not selling our best ones.